This unit holds the rubber flapper item 40-0004 on our prize wheels and possibly others by inserting the flapper in the slit on the bolt and then tightening with the two wing nuts provided. 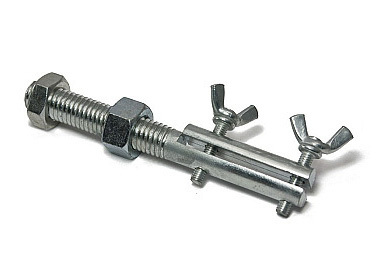 This unit also comes with two 5/8 inch nuts, one thick and one thin for attaching the bolt to the pole. This is custom made but should work on other prize wheels if the hole is 5/8 inch where you insert the bolt. Measures 5/8 inch x 5 1/2 inches.